Rouse has settled in, it seems, and found a way to encapsulate all the dichotomies of life, making them work within the confines of a three-minute pop song. Domestic life, for all its blissful notions, can be destructive. It's a force to be reconciled with; a horrible truth into which we all must settle or fight against. Literary giants like Richard Ford, Raymond Carver, and Alice Munro have plumbed its depths and found the truths to be painful and often difficult to confront. Filmmakers as diverse as Alexander Payne, Wong Kar-Wai, and Judd Apatow grapple with the subject in varying and middling ways--sometimes to great success (Payne's Sideways) and sometimes to artistic detriment (Apatow's This is 40). Musicians have occasionally tackled the subject in more cloying ways, opting mostly for a variation on a love song or high-brow concept albums (Cursive's Domestica comes to mind). 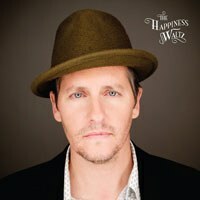 But Josh Rouse has spent most of his career finding innate ways to express the discomforts and joys of domestic life. It's blissful and transcendent; but also brutal, debilitating, and, most importantly, inescapable. Rouse doesn't shy away from its allure. In fact, he's so attracted to it that it can be off-putting if you're lacking a sentimental side or don't long for the type of companionship he spends much of The Happiness Waltz celebrating. But you would need a lump of icy coal in place of your heart not to feel some affection for Rouse's subjects and, more importantly, his musical treatment of them. Rouse has a Midwestern, plaintive delivery that barely rises above a conversational tone. His singing voice is earnest, almost gentlemanly, as if he were coaxing you to believe in his own brand of medicine. And when he tones it down vocally and instrumentally, as he does on a few calmer numbers like "The Happiness Waltz" and "It's Good to Have You", it's easy to buy into Rouse's vision of domesticity. Rouse's song titles always give him away. "Simple Pleasures", "It's Good to Have You", and "Start a Family" are all exactly what they seem. There is nothing cryptic or intentionally vague left to ruminate on lyrically, which is alarmingly beautiful in an era when artists are falling over themselves to hide their vocals and lyrics behinds ironic and electronic masks. Rouse has no issues wearing his heart on his sleeve and some of his lyrics would falter in less earnest hands: "coffee and toast and a peppermint tea /it's a little too cold to go outside /wonder what would happen if you lived with me?/I got the feeling it'd turn out nice". Later, on "Start a Family", Rouse paints an indelible scene of family, one that can only be described as picturesque: "Moved to a place on Henry Street...she's picking out the curtains/my hair has turned to grey/but it doesn't matter anyway". When Rouse commits to a song lyrically, it's never half-hearted; there's no room for anything other than the narrative of the singer. But none of this would amount to much if Rouse's ears weren't tuned directly in to what makes a pop song unavoidably pressing. It's in the ringing guitar and the downtempo mellotron in "Julie (Come Out of the Rain)", the vibraphones that punch the introduction of "Simple Pleasures", the waltzing slide guitar of "The Ocean", and the horn breakdown of "A Lot Like Magic". Rouse has no problem adding any instrument into the mix if it moves the song forward. On earlier albums Rouse hadn't quite mastered instrumental cohesion, but on The Happiness Waltz he has. He's never made any effort to hide his influences-- Stevie Wonder, Leonard Cohen, and The Beatles are written into his DNA--but he has incorporated them piecemeal into his own unique voice. Every element in each song belongs to him now, as a color on his palette. Which is why it's a bit self-reflective to hear him sing, "working on my masterpiece/one of these days I'll get some sleep" on "Start a Family". Rouse may have earned a rest, but, somehow, it feels like he's only just begun. After spending many years abroad in Spain and some subsequent resulting albums that were grounded in that locale (Subtitlo, El Turista), it's nice to have Rouse back treading distinctly American soil. Not that previous escapes were unimpressive or lacking; rather, they displayed Rouse in transitional mode, spinning his tunes outward from his physical surroundings. In fact, most of Rouse's album titles contain some sort of specificity, be it time or place; Nashville, 1972, and Dressed Up Like Nebraska are but a few examples. The Happiness Waltz is a big contender for Rouse's best work, though fans will always point to varying favorites (I will always fall back on Under the Cold Blue Stars, when Darren Jesse provided drums and Rouse's songwriting housed some darker corners). Rouse has settled in, it seems. He's found a way to encapsulate all the dichotomies of life and make them work within the confines of a three-minute pop song. Some musicians never achieve that; it took Rouse almost fifteen years. But all good things are worth waiting for, and that's a lesson only time and maturity can teach us.